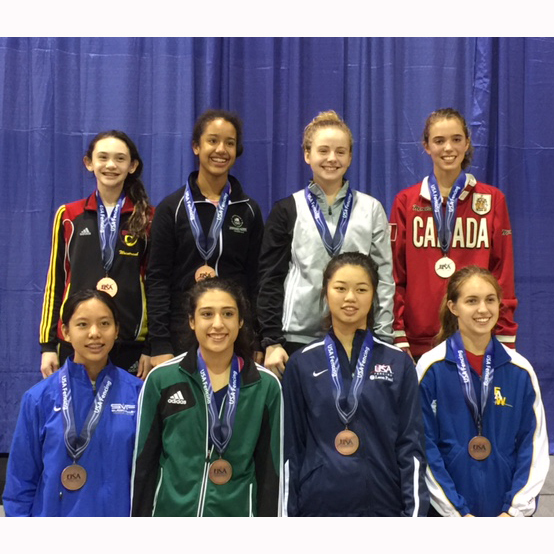 Jerrica Liao, grade 10, took fifth place at the USA Fencing North American Cup tournament in Richmond, Va., this past weekend! There were 156 entries in the Women’s Foil Cadet (age 17 and under) field. Liao powered through pools, winning all her bouts with a +12 indicator, seeding 11th into the tableau. She then cruised through her first elimination bout, but had a tough one against the 75-seed, scraping by 4-3 (bouts go to 15 touches or 9 minutes of fencing time). Climbing the tableau, she next pushed past a Ukrainian fencer 10-9, crushed her next opponent to make the top eight 15-7 and finally lost to the eventual silver medalist. Liao reached a serious milestone in any fencer’s career in this event, earning her “A” rating. Most hearty congratulations to this fine swordswoman, a credit to her club, Silicon Valley Fencing Center.